In the garden outside the House of Green Gables in Prince Edward Island, an array of flowers blossom and adorn the front property. As tourists wander around the property at this National Historic Site, they will see how Lucy Maud Montgomery was inspired when writing Anne of Green Gables. House of Green Gables, Cavendish, P.E.I. Provincial Park, P.E.I., Canada, North America. 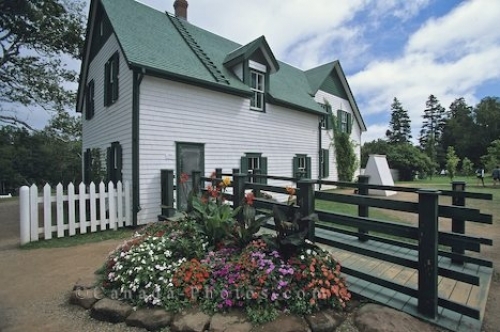 Picture of the property that surrounds the House of Green Gables in Cavendish, Prince Edward Island in Canada.